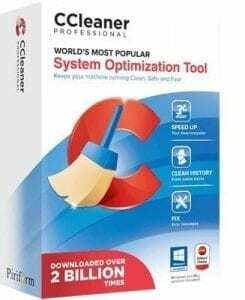 The CCleaner professional edition is a perfect PC optimizer for you. It performs very well with almost zero problems. When PC users need an optimization tool, CCleaner is one of the most popular choices. But, How is it in 2019? This CCleaner Professional review explains everything. When you have a PC, you may notice it is becoming slower day by day. In fact, It is a pretty common matter. To get rid of this problem we often do a fresh windows installation. We also use some third-party programs like CCleaner, Advanced SystemCare, etc. to optimize performance. But, Which program is best to speed up a slower Windows or Mac? People may suggest different names. So, You may become confused. That’s why I suggest you go through this review. If it suits your needs, you can consider this one. The CCleaner is developed and distributed by Piriform Ltd. It is one of the most popular and widely used programs. A huge number of people also trust it more over other similar tools. Why? It is common that Computer slows down over time. To optimize its performance, This tool is one of the oldest choices. But, It has many more things that gained people’s trust over the past years. 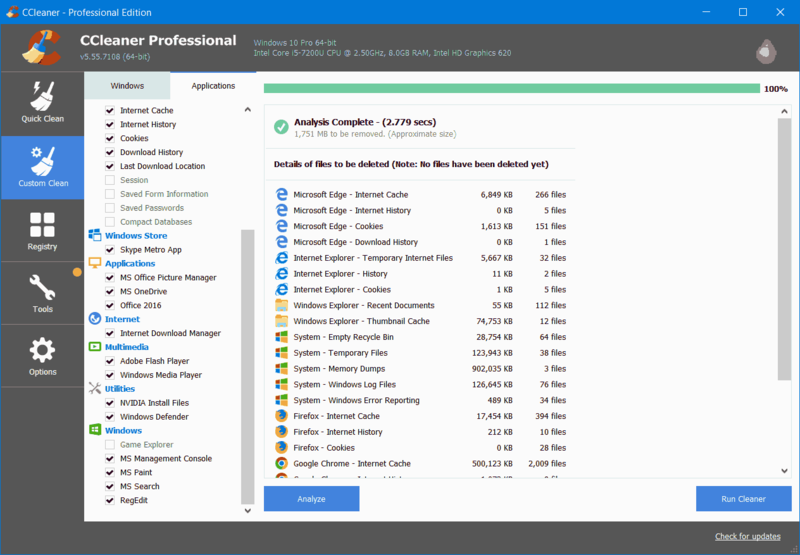 Read this CCleaner review to learn more about it including its features, performance, pros, and cons. This PC tuner software has many cool features. But, The followings are the most useful. 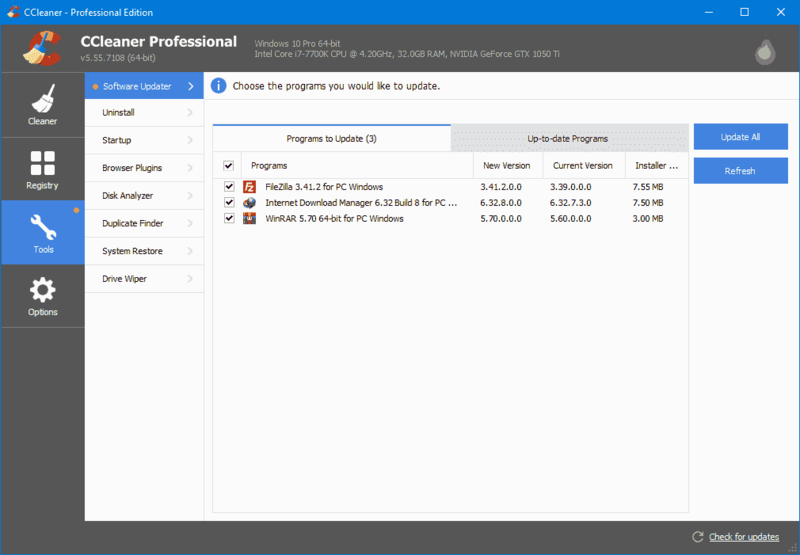 These are the major features of CCleaner Pro. The free version has all these features except real-time monitoring, software updater, and automatic update. You will also find some other cool features while using it. By the way, These features are very powerful. It is the main feature of this tool. You can run a deep scan to find out junks, temporary and unnecessary files on your PC including internet cache, browser history, etc. The best thing is, you can choose what to scan. For example, I exclude Browser history and cookies while scanning. It means you have more control over the scan process. 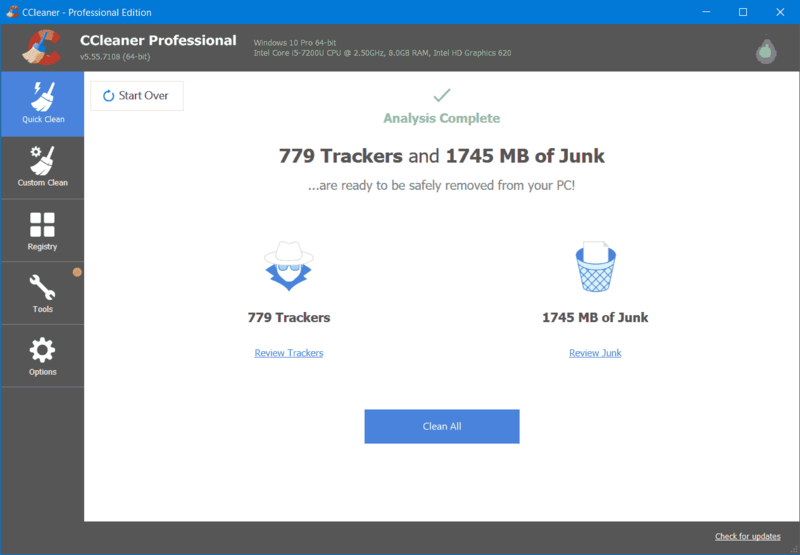 After scanning, the CCleaner professional will show you how much space these junks have taken from your hard drive. Then, You can clean them all or whatever you want. You also can do it with a single click. There are so many similar tools available. But, CCleaner’s registry cleaner is more trustable to me. In my whole life, I have used so many registry cleaners. Some of them broke my system. But, It never happened with it. At least, It worked perfectly when I reviewed. Anyway, You always should use this feature with risk. Because registry cleaner should be run only when it is necessary. 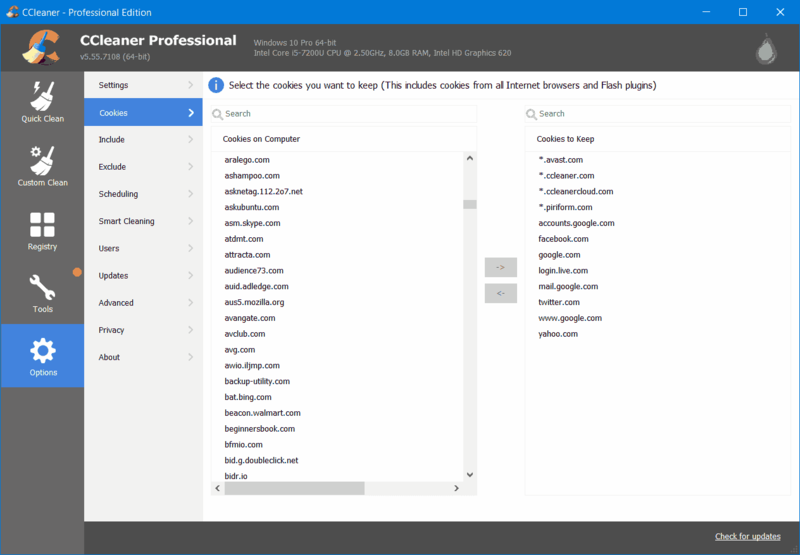 It is the new feature that debuted in CCleaner Professional v5.5. In fact, It was the most expected feature. Now, You can check for the updates of other software installed on your PC directly from your PC cleaner software. Outdated software can be a security risk for your system. This feature will definitely help. Though, You won’t be able to check for all of the software updates from here due to some limitations. Do you know CCleaner has an uninstaller tool? Of course, it is not as good as the dedicated tools like IObit Uninstaller, Revo Uninstaller or Ashampoo Uninstaller, etc. I have also reviewed them. So, You can check them too. Anyway, CCleaner’s uninstaller is definitely helpful for you. Because you are getting it as an extra feature. Another great thing is you also can remove, disable or enable browser plugins from this software. You will also be able to manage startup programs directly from this software. This PC tuner includes many useful tools like System Restore, Duplicate finder or even drive wiper. You can easily restore windows to an earlier state from this software. Else, You can use Drive wiper to clean your hard drive space so that recovery software can’t recover your private information. A duplicate finder can find the duplicate files from your hard drive which helps a lot to gain more free space. It has so many useful features. You will only discover them when you will use it. For example, the CCleaner can enable or disable items in the context menu which is essential for expert users. It can monitor your PC in real-time and can automatically clean junk files. But, You also have the option to decide which files to clean. The scheduled scan is a great feature. You can set when it scan and clean regularly. It also can scan and show you the browser cookies. So, You can delete each cookie individually. It is a decent feature indeed. Else, The Options page contains some other cool tweaks which will help you in many situations. It has a very clean, simple and modern interface. Almost all users should find it extremely easy. When you open this program, you will find all of your needy options. You can navigate to different features very easily. I don’t have any complaint about the interface. The user interface of CCleaner is very familiar to all people. So, There should not be any problem. When you talk about the performance, It is one of the best. In fact, Performance is its key to success. Among the PC optimization programs, It is one of the programs that performs very fast and smooth. But, I guess it has the best performance score. Every function works perfectly. In fact, I have used it exclusively for a long time and never faced any problem. Everything seems very polished and optimized. All these compliments may make you think that this CCleaner review is a bit biased. It’s not that. I’m just saying what I have experienced. At least, It is what I have found when analyzed its in-depth performance. But, I still feel that it should have some more features. While reviewing CCleaner, I have not found any major downsides. It is an excellent program indeed. But, It is not a feature-rich program like some of its competitors like Advanced SystemCare Pro. It is still laking some cool features in 2019. Though some people like it for its simplicity. Excessive features can make it messy. Also, Its software uninstaller is basic not something like Revo or IObit uninstaller. The CCleaner Professional price is $24.95. It also has a free version. Now, A promotion is going on. So, You can get it at just $12.47. The pricing is yearly basis. But, You can use your license for lifetime. Only thing you won’t get any support after one year. But, You will get updates which is a big thing. Free trial is also available. To get it, follow the button (link) give below. I hope this CCleaner Professional review has given you an idea about this software. It is pretty fast and smooth program. I don’t have any issue to reccommend it to you all.